Are you afraid of the dark? Do you feel in your pounding heart that monsters are under the bed? Carl Restivo understands. When both of his kids had night-time fears of ‘creepies’ in the dark, he decided to “fight monster with monster” – and Scare-Me-Nots, stuffed heroes equipped with extraordinary fear-squashing skills, were born. 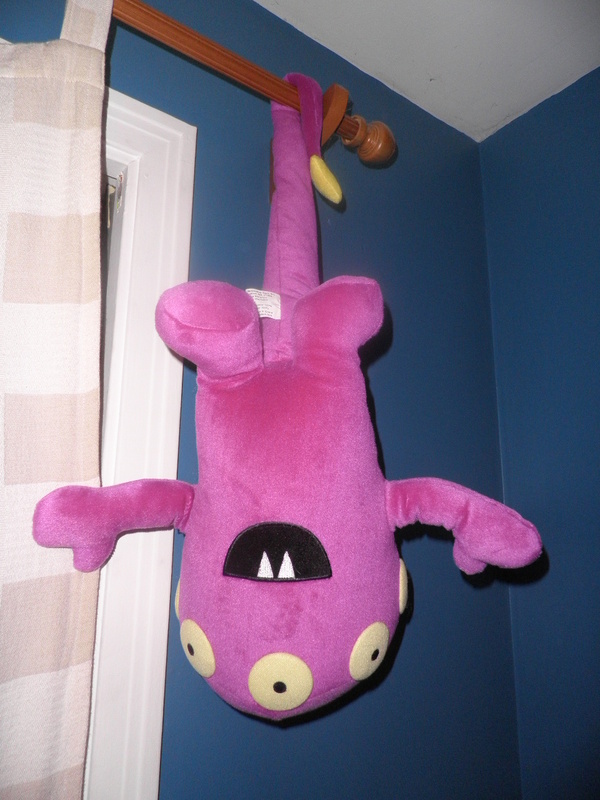 The Scare-Me-Nots, whose collective mission is to help children with any fear, have long velcro-tabbed tails so they can hang down to keep watch under mattresses, clear monsters from closets, or pull all-night guard duty on doorknobs. Carl’s website, www.scaremenots.com, details his story and the inception of these award-winning “monsters” far better than I could. Plus the site is really fun. You get to find out how each Scare-Me-Not serves a precise purpose, only after having graduated from the prestigious Scare Me Not Academy. These are no ordinary toys, you understand. Watchdog Wally is a master detective, for example, while Valiant Valerie specializes in opponent territory infiltration. Carl lives just outside Clifton Park, which makes the Capital Region home to a great innovator. His Scare-Me-Not monsters are available for sale on his website and also at Wit’s End Giftique on Route 9 in Clifton Park. But Carl’s not just a creative entrepreneur; he’s a quiet philanthropist as well – an unassuming man who doesn’t sing his own praises. I had no idea that he’d developed a special Scare-Me-Not, Deep Breath Dudley, especially for kids with apnea and other sleep disorders, offering proceeds back to the Infant and Child Sleep Apnea Awareness Foundation. And Carl also offers a Scare-Me-Not to every child entering new homeless shelters in California through a program called Project Night Night . Perhaps most impressively, through the Northeast Parent and Child Society (and with the help of The Capital Team of RealtyUSA and 1st Priority Mortgage Company), he presents a Scare-Me-Not to every child placed in a foster home. When I met Carl he decided to give again. We were out for coffee and a chat, and he’d brought two of his Scare-Me-Nots, simply as nice-to-meet-you gifts. Those of you who’ve read my column “Normal is a Dryer Setting” may remember that my 9-year-old son Jonah has severe behavioral problems and is now in residential educational care. I told Carl that I’d like to give the Scare-Me-Nots to Jonah’s school for their silent auction. He smiled and said that would be just fine. I dropped the two Scare-Me-Nots off at Jonah’s house and told a staff member they were donations for the auction. Next time I came to visit Jonah, the gala was over but the Scare-Me-Nots were still there. In fact, one of Jonah’s house-mates was clutching one tightly as he rocked back and forth on the couch. “The kids loved them so much we couldn’t take them away,” explained one of the caregivers. When Carl heard that, he donated enough Scare-Me-Nots to the school so every incoming residential child in 2012 could have one for free. There were a few extra Scare-Me-Nots left over, and I gave them to places I thought Carl would approve of: a local childhood cancer center, an autism classroom, and a rescue mission. I admit, though, I kept one for myself: Defender Dave, who has eyes all around his head so monsters can’t sneak up on him. I hung him by his velcro-ed tail from the curtain rod close to my bed. I don’t care if it sounds silly: I love my Scare-Me-Not. Even grown-ups have monsters to fear, and Defender Dave helps keeps mine at bay. More importantly, he restores my faith in humanity. Every time I see him, I’m proud that our own little corner of the world has such imaginative, generous people like his creator in it. Amy Wink Krebs lives in Albany, NY, what she likes to call “our pretty little city.” She loves discovering cool things for kids in the Capital District and then telling you about them. Please write to Amy at winklett@hotmail.com. Please go to the Scare-Me-Not facebook page and “like” them! I just love those scare-me-nots! I wish I had thought of it. I spent my childhood removing toys from the bedroom because they frightened me but maybe a scare-me-not might have kept them all in order. Yours will surely do its job well. I really like your writing style, great info , thankyou for posting : D.